Comments and Feedback: Parking is bad enough (limited & expensive) and when the weather is not great, people will opt to go to the shopping center or the mall because there is plenty of free parking. Comments and Feedback: Residents of the town were ALREADY not coming to town because of the parking.....it should be FREE! Now, without the use of their parking cards and the new rate hikes, they are FURIOUS. IT has been THE CONVERSATION starter in the stores this entire holiday season. And the timing of installation was POOR. It do this during our busiest season was dumbfounding. For seniors in our area, totally confusing. It would be better to be consistent with the University meters, for starters. We also own other operations in Pennsylvania where parking is free or significantly cheaper. I have personally seen customers in our other stores in PA and have asked them why have they started to shop in PA instead of Princeton. They specifically say parking is the #1 issue. I understand that there are differences in townships and states, but you will drive consumers away from supporting their local businesses if it is too cumbersome or too expensive to park downtown. Consumers will turn to other shopping areas or turn to online shopping and you will start to see your local economy drop. For those of us who sell inexpensive repetitively purchased items, no one wants the customer to add $1.00-$2.00 to their small purchase. This will kill business in the downtown and force customers to other areas like the Princeton Shopping Center. Traffic is already down significantly on weekdays because the entire adult population works. Our merchants cannot be totally supported by the 1% - many of whom WORK! We also now have to compete with e-commerce and free shipping. Please be more mindful of the merchant's life / livelihood. Thanks for listening. Comments and Feedback: You took away all the parking in front of ………... We have an older clientele and it is really hard for them to park far away. The parking on the street is too expensive and customer don't even want to bother coming into town. Comments and Feedback: We have Customers every day, say that they don’t shop here in Princeton, anymore, because of the parking situation. Also, we have customers every day who won’t buy more in our store, because their parking meter is almost out. They are, so often worried about their parking meter. Everyone complains about such a BIG increase. They can go to the Mall, where parking is free! Comments and Feedback: It has deterred my agents from coming to the office. Several of them have gotten tickets and parking in the Spring Street garage has been a challenge if you need to come to office in the middle of day. Comments and Feedback: We get customer is running in and out of our stores because they don’t wanna pay for the parking. Or they can’t find parking. The holidays were challenging for us especially when we were fulfilling huge corporate orders, we would have to hand carry the orders out to wherever the customer found the parking. Customers complain that the rates of the garage are high and unfortunately they are the same for associates. It’s hard to keep a staff with the parking rates. We reimburse them, but an associate typically pays about $16 a shift and it takes us as a company about a month to reimburse them. So by the time we are reimbursing them they have already come out of pocket about $80-$100 a month. Comments and Feedback: The Parking in Princeton is not geared for businesses in Princeton to survive. The increase in parking will drive more clients to other areas. 3 days ago, I lost several clients to Hopewell due to the parking in Princeton. The township is more concerned with reducing 80 parking spots and putting in a bike lane. How is this bringing revenue to Princeton? Since I have being in business in Princeton for 9 years, not one thing positive has ever being done for the business community. Customers have said they are now reluctant to come downtown. I understand the need to increase revenue for the town, but increasing the parking prices by (up to) 80% will have a negative impact on merchants. We are already dealing with the online takeover of retail and are struggling to stay afloat. Making parking more difficult and expensive will certainly affect our business and will be a consideration when it's time for our lease to be renewed. Especially when there is free parking at Marketfair, Quakerbridge, Princeton Shopping Center, Hopewell, Pennington, Madison Maquis (being built by the airport) and the other center being built in Belle Mead. This is a competitive market and there are lots of empty spaces downtown. Palmer Square has become desperate to fill spaces with anyone who can pay the rent, even if the business isn't necessarily aligned to Palmer Square brand (note: t-shirt shop and ax throwing venue). Combine empty stores, a difficult brick-and-mortar economy, lackluster tenants, escalating rent...then add significant parking challenges and price increases that keep ...this initiative appears to be short-sighted and detrimental to our wonderful downtown. I totally geeked out and looked up how much parking tickets were all across the USA and we seem to be one of the highest except for a few major metropolitan areas. Philadelphia and New York are both cheaper than us. It just makes people angry, not the purpose of a ticket. Both New Brunswick and Asbury Park are still cheaper than us, although I was told we modeled our fees after these two towns. - New Brunswick is progressive- $1.50 an hour for first two hours and then $2.00, $3.00, $4.00 up to $7.00 for the eighth hour. - Asbury Park peak season is $1.00 an hour except at night between 5pm-2am and Saturday and Sunday when it is $2.00 an hour. The rest of the year it is between $0.25 and $1.00. - Summit NJ is 90 minutes $1.00 an hour 3 hour, 5 hour and 12 hour all $0.50hour. - Redbank Street meters 15 minutes $0.50, 30 minutes $0.75, and 1hour $1.50 up to 4 hours. Designated Redbank Municipal Boro lots $1.00 an hour. - Westfield NJ is $1.00 for two hours. - Morristown is $1.00 an hour. Not sure where they came up with these fees. There is a disconnect between the government, university and merchants. The downtown matters, and by default what is in the downtown matters. The Princeton municipal government acts in a manner that intimates the merchant community is often more of a burden than an asset, in contrast to many other places where they are viewed as the backbone and lifeblood of the community. Retail, restaurants and service matter. The town should be working in conjunction with us. We should all be in this together. It is a partnership, it is what makes community. We cannot fight this fight alone. Comments and Feedback: We're hearing a lot of negative feedback: a lot more expensive, you have to pay for the app so not using, the app seems completely separate from machine (i.e. no correlation between payment at machine and "history" in app), can't get refund for unused paid time (used to get credit applied to old smart card). It seems very "unfriendly" to people who commute here for work. Our employees have been very concerned and disappointed with the new system. 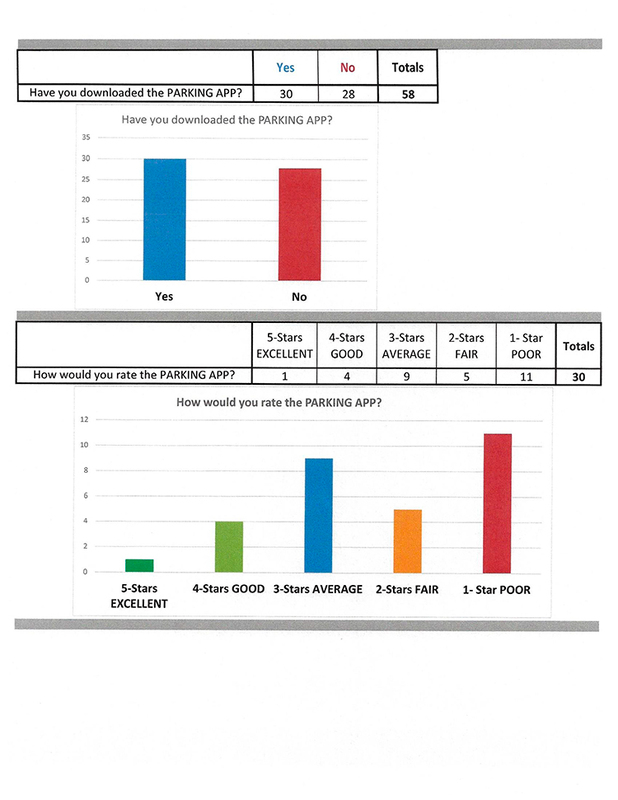 Comments and Feedback: 95% of our customers have expressed their unhappiness with the new parking meters. Comments and Feedback: The meters are difficult to engage/use. The convenience fee and minimum times in some cases are unexpected costs. The cost to park in Princeton is very high, it was high and with the increases, it exceeds high. Comments and Feedback: The rates are exorbitant - this is not New York City. No one wants to use a credit card for small amounts on a tigertown app and no one wants to carry a roll of quarters at all times. The meters should all have the same rate, except for the all day rate. Fifteen minute meters are ludicrous. The rate should be returned at least to its former rate which was also too high (same as Philly). The layered rate structure of this new system seems to deliberately confuse, which will increase the amount of tickets written. Was that the goal? Comments and Feedback: Parking spots were removed. How is this possible in a town where parking is a problem? Customers find the new meters expensive and confusing. The app is not user-friendly. Since they are solar powered, often the backlit screen does not light at night, requiring a flashlight to see the screen. Long-term (10 hour and all day) parking for employees has been moved too far away. Comments and Feedback: Customers continue to let us know that they are very dissatisfied with the new parking arrangement. They have remarked that the rates are significantly higher, parking is more troublesome, and the meters, themselves, are not easy to see (in glare or at night in the dark) or interpret. Those customers who have expressed dissatisfaction commented that they were less likely to come in to town to shop. Comments and Feedback: Since the parking rate has gone up we have seen a serious decline in our customer traffic. We have had a number of customers complain about the new parking rates and how "unfair" they find it to be. As the Front of House Manager here at ……… I am more than disappointed in the parking rate and paying to park here has become a serious issue to my income. I already commute 30 min and now I have to pay over 2 dollars an hour to park for a 10 hour shift (unreasonable). I am concerned not only for our business but the other small businesses here in town. Please consider how it is effecting everyone, from customers to employees to the actual business's themselves. Comments and Feedback: I am happy to keep taking my customers names and complaints for your review at a later point in time. Not one person has said this is better, easier, more convenient...Folks are literally just miserable, and not shy about telling us! My December numbers are down over last year after being up the six months before. I am waiting to tell you until after it is all over, but for sure our traffic is down. Comments and Feedback: Almost every customer comment about parking that we receive is a threat to not return to the square. This is because of 1. The lack of grace period; 2. Rate increase; 3. Enforcement until 9:00pm. We have told customers to contact the Princeton Borough to lodge their complaint, and that we have no say in the matter. Questions #6 & #7: This is difficult to say because the meters went up just before the holiday shopping season. Customers say they love our store, but won't be back due to the parking. Sidenote: I visited the parking company to ask for a loading zone in front of Mediterra (where all the trucks currently park, including the mail truck) and I was told that the curb in front of Mediterra must be kept clear for emergency vehicles to make the turn. Imagine my surprise when 2 parking meters went up in the exact place I was told had to be kept clear. It's now turned into a free-for-all and the crosswalk is frequently covered by cars with their flashers on. Comments and Feedback: Some more mature guests have commented that the meters are difficult to read the screens to figure out how to use their credit cards. Other guests have complained that the sun glare off of these screens make it difficult to see during different times of the day. We have had a lot of complaints about the spaces right in front of our store are no longer spaces and difficult to notice that they have changed. They moved the signs, but a diagonal line or an X by the pedestrian crosswalk on Palmer Square West would be very helpful, as many people have been incredibly angry when they received a parking ticket as they claim it is unclear. I did have one lady go to park there, and then I explained it was not a space...she went just up the street to repark but then decided to leave instead rather than to come in to shop with us as she intended. Comments and Feedback: Doing something with the parking decks for employees would be nice. It stinks that some employees pay upward of $20.00 a day just for parking. That's essentially an hour of pay gone to pay for parking. The free parking hours are great but it is obviously tailored to restaurants in town. my best traffic comes before 5pm. after 5, it's pretty much folks killing time before or after dinner reservations - no one really buying anything. It's actually a waste of resources and labor to have to stay open so late. If they want to support all small business downtown, they would offer free parking during the day when less people come to town to encourage more folks to come. Folks are going to come to the restaurants anyway and pay whatever for parking to have a nice meal at our great restaurants. I don't know if the customer traffic has changed as a direct correlation to the new meters but traffic is down for us by almost 1/2 from last year for the holidays. I understand that the meters needed to be changed but they have to help the small businesses here. Make weekends (all weekend) free for all of December. Sales tax revenue will increase, more businesses will invest in downtown, more folks will come and eat during the day which is always good for restaurants too. Downtown Somerville has free holiday parking from Thanksgiving to New Years and their rates are much more reasonable even if you do pay. And I believe they use the same machines. Comments and Feedback: Our clients have all been complaining about the parking rate change, decrease in spots, and hiring of more meter-men. Comments and Feedback: The app would be more useful if you could pay for parking via app before 9 am. My employees who use it tend to park before 9am and it's truly an inconvenience. Also, the 0.35 cent fee ON TOP of the rates is disappointing. We are frustrated that the 10 hour meters were moved so far away. Comments and Feedback: Most of my customers are finding parking expensive and inability to get their money back like previous is causing them a feeling of unfairness. Comments and Feedback: Complaints from clients include: coin feeding does not always work, parking starts at 9 - no way to pre-feed, display hard to see. Comments and Feedback: a lot of customer complaints about prices! Comments and Feedback: Our customers are "drop & Go" they are frustrated that it is such an effort to simply park for a few minutes. The new meters have a minimum which the old ones did not. It is not fair to say that all of our decrease is due to the meters however. With the closure of Cool Vines and the Spice shop, it has been much slower in general on Spring Street. Comments and Feedback: My clients have a hard time justifying by $2.25 per hour to come workout 4-5 times per week. That being said, we have lost a few clients because the parking is just too expensive. I have also had clients tell me (that are paying the new parking fees) that they are going out to route 1 after class instead of walking around town to do errands. Comments and Feedback: The parking has been a disaster. The coin part of the meter is regularly jammed so customers can't use (I spoke with a gentleman retrieving the coins from the meter and the canister is so small that it fills up quickly and thus gets jammed easily) most non-local customers want to pay with coin. I haven't confirmed, but was told there was a service charge to pay with a card. Many local customers had smart cards with balances- one customer told me if it wasn't used by the April end date, she would be charged an administrative fee to get a refund, which is outrageous. 2 hour parking went from $2.50 to $4.50. I can't imagine a justification for doubling the price. Also, to roll out this new system, with all the bugs, DURING THE CHRISTMAS SEASON, was not well thought out. Comments and Feedback: There are many hiccups to the new system: trouble with certain credit cards (Amex and Discover), difficulty reading the screens, non-working meters, problems using coins, no clear prompts on the meters etc., but these are not that troublesome. What my customers ARE upset about is the essentially doubling of the rates. The response has been very negative, with some patrons threatening to boycott Princeton entirely. To have to pay for parking upwards of $7.00 or $8.00 to go to dinner and a movie is daunting to many, and adding a 35 cent fee on top of the rates to use the app is just insulting. I have had at least a few customers who are saying that they want to support local business, but the cost to park is now more than the shipping charges would be to shop online. While my answer to #6 above is "no difference" for now, it has only been a few weeks, and I think it very likely that these rate increase will indeed reduce the customer foot traffic (which is already down around 10% year over year with the changing retail climate). Comments and Feedback: Clients are very unhappy. We are trying to keep our business open in a very competitive retail world. This is not helping. I heard people are now going to the shopping center instead. Comments and Feedback: Meters are hard to use, app charges a convenience fee that is ridiculous! Also employees have very few options for parking during an entire shift, especially in the mornings. Need better employee parking options! Comments and Feedback: Many customers have complained about the increase in parking prices and mention it negatively affects how they feel about shopping in Princeton. We have also had some customers mention that they initially have difficulty getting the new meters to work properly when using credit cards and are confused about how it works. A few customers have mentioned they appreciate that with the app you can add money and time to your meters remotely. Comments and Feedback: Our Customers and Staff agree that we feel the parking system is deplorable. Your meter maids are RUTHLESS in their vendetta to fine people. There needs to be free employee parking, we provide a service to the community and deserve somewhere to park. Comments and Feedback: As you know, we're not in the downtown but we hear our customers squawking about how expensive it's become to shop downtown and that it's also difficult to understand where to place your card and that there's a credit card processing fee to boot. Comments and Feedback: We lose business from people who do not have mobile app (understandably) and cannot justify paying $1.50 to park for 3-5 minutes to purchase a $2.00 cup of coffee. It makes no sense. We are losing customers. The rates are a slap in the face. Our customers feel this and tell us as much. Mid-town Manhattan rates start at 4.50 an hour. Get out of midtown (still in Manhattan) and it is less. This cannot be our point of comparison, our yardstick. University towns that do compare to Princeton, as well as many other towns and small cities that are sensitive to the role of brick and mortar stores at this time of the year offer free parking for holiday shoppers in their garages. I would have hoped this is the direction we might move in. I still hope it.